Oh goody. Another one of these. We swear, each year, you folks demand something scarier. The frightening clown costume from last year just wasn't good enough for you and you request something more frightening. So, every year, the scary clown costumes get more terrifying. We get less sleep, due to terrible nightmares involving clowns and, of course, you get to go have your jollies scaring folks with a creepy new outfit! Well, congratulations! You win. 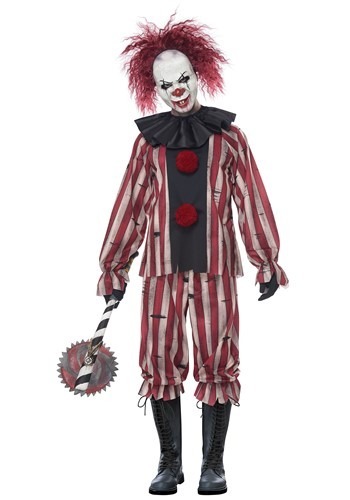 This Nightmare Clown Costume could not possibly be any more frightening. It's also been weeks since any of us at the office have had a peaceful night's sleep since this thing showed up on our doorstep! What makes this costume so terrifying? Well, first of all, the shirt and matching pants might have a cheerful red and white striped pattern, but the ragged scuff marks add a sense of murderous intent to the outfit. The collar is pitch black, like the cold, icy hand of death, kind of black. But neither of those things are the reason why this costume is the scariest clown costume we've ever seen. No, that honor goes to the mask. The mask is the reason we don't sleep at night! It has the classic white face of a clown, but the smeared lipstick around the mouth looks like the work of a maniac. And the dripping black paint around the eyes? That's something that you'd never want to encounter at a circus. Trust us. We've seen plenty of scary clown costumes. Most of them give us the willies, but this Nightmare Clown Costume has got to be one of the most frightening ones we've seen to date. Please, please, PLEASE, don't ask for scarier ones. We're not sure if we can handle anything more frightening than this costume.